The Kolkata All India Conference has taken a very important decision on negative stand of the government on pension revision. 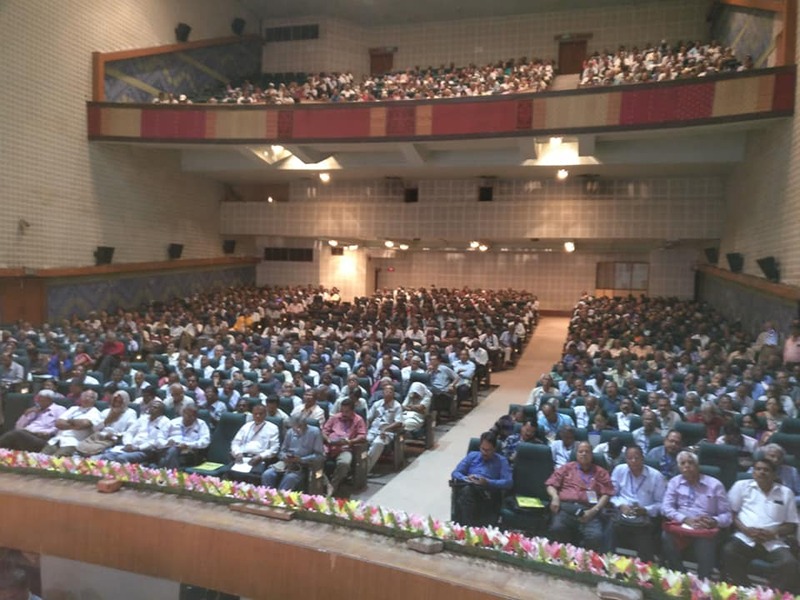 The Minister of Communications,Shri.Manoj Sinha had given a categorical assurance to the AUAB leaders to the effect that Pension will be delinked from the wage revision and early action taken for the same. But DoT officers are still for pension revision after wage revision, posing themselves as super ministers. So it is a drama being enacted to deny and delay the Pension Revision. The AIC has taken serious note of this violation and decided for an impressive protest action in the form of SANCHAR BHAWAN MARCH on 15-03-2019. The March will start at 0930 from Eastern Court and after the March we will join the NCCPA Fast at Jantar Mantar at 1100. Advisor : Com.V A N Namboodiri. The people of Kashmir valley and all shades of political opinion there are highly perturbed by reports of the efforts to do away with Article 35A of the Constitution. This has come in the context of the petitions being heard in the Supreme Court challenging the Constitutional provision and the fact that the Central Government has not made its position clear on the matter. Article 35A confers the power to the Jammu & Kashmir state legislature to define who are permanent residents and their rights. Any attempt to tamper with this provision will fundamentally damage the special status accorded to Jammu & Kashmir under Article 370 of the Constitution. Kerala Government constructs accommodations for Migrant Workers. The Kerala LDF Government has taken special initiative for the housing of the large number of migrant workers, including from UP, Bihar, W.Bengal and other northern states. Residential complexes constructed for their accommodation. A special programme called ‘Aawas’ is planned and cards are also issued in this connection. Kerala has got lakhs of migrant workers doing various jobs in the state. Kerala government understands their difficulties and requirements. It is to be remembered that a large number of Keralites are working in gulf countries, US, Canada, Australia etc. and the government very well understand the problems of the migrant workers. Migrant workers also realise that Kerala is one best place to work and that there is no discrimination to them in Kerala. A National Convention of Trade Unions will be held in the Constitution Club Annexe, Rafi Marg, New Delhi (within the campus of Mavalankar Hall ) 1.30 pm on 5th March 2019. The Convention will review the 2 days national strike on 8-9 January 2019 called by the central trade unions and also decided future course of action. In addition to the delegates from the CTUs, delegates from CG Employees, State employees, PSU employees including BSNL employees and other delegates will participate. 20 delegates from BSNL will be participating. Com. K.G.Jayaraj, General Secretary, AIBDPA addressed in detail the AIC of AIBDPA at Kolkata. It covered all the important points to be discussed in the AIC. The speech was much praised by the house. It was enthusiasm all along and the 1000 odd delegates marched from Yuvabhart YouthHostel , Salt Lake Stadium, Kolkata to the Purbashree Auditorium (Com.Sisir Bhattacharjee Nagar), Eastern Zonal Cultural Centre, Salt Lake , raising slogans in different languages, reflecting the diversity in unity. The procession reached the venue at 10 AM and the National Flag was hoisted by Com. Ananta Kr Bhattacharjee, President and AIBDPA flag by Com.K.G.Jayaraj, General Secretary. Thereafter floral tributes were paid to the martyrs under the leadership of Com.V A N Namboodiri, Advisor. The house assembled fully and good number of delegates were also accommodated in the balcony and still some of the delegates could not make it as it was jam packed. The music party consisting AIBDPA comrades presented melodious welcome song. Then, all the leaders/ guests were felicitated by the Reception Committee. Com.A.K.Bhattacharjee, President presided over the inaugural session. Com.Bikas Ranjan Bhattacharya, Chairman, Reception Committee delivered the welcome address giving the significance of Kolkata since the British East India Company era. Com.A.K Battacharjee in his presidential address recalled the sacrifices made by leaders like Tarapada Mukharjee and K G Bose and the numerous struggles waged against injustice and for the genuine demands of the workers. Delivering the inaugural address, Com.Hannan Mollah , General Secretary, All India Kisan Sabha minced no words in exposing the anti-farmer and anti-worker policies of Narendra Modi government. He shared the experience had with the great Kisan rally at Nashik , Maharashtra on 21-02-2019 and how the Maharashtra government was compelled to settle the genuine issues in full. The Hindutva philosophy being aggressively pursued by the sangh parivar is supported by the government and all the constitutional institutions are saffronised. He also criticised the anti-PSU policy of Modi government due to which 4 G spectrum is denied to BSNL. He congratulated the BSNL workers for the glorious three days strike . Com.P.Abhimanyu, General Secretary explained the circumstances under which the AUAB had to go for the three days strike from 18-02-2019 and the workers made the strike glorious by participating boldly ignoring the ESMA invoked by the government. The government move to kill BSNL is being resisted unitedly by the workers and he acknowledged the support and solidarity being extended by AIBDPA. Com.P.Abhimanyu made it clear that regarding pension revision the AUAB demand is for pension revision with 15% fitment and ridiculed the demand of certain pensioners organisations for CPC fitment. 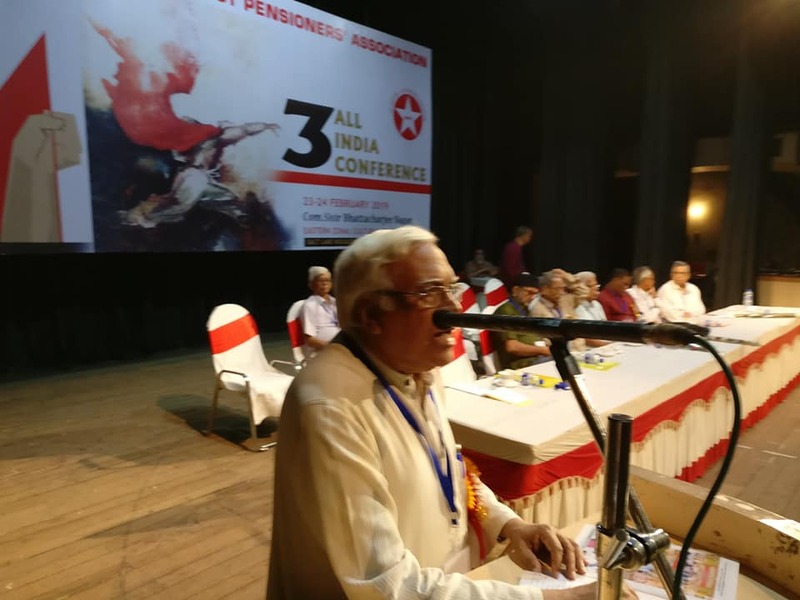 Com.V A N Namboodiri, Advisor in his address reiterated the correct and principled stand of AIBDPA on pension revision which is vindicated by AUAB. Coms.S S Roy, Working President, NCCPA, Animesh Mitra, Secretary General, BSNL CCWF, R N Dhal, AGS, AIPRPA and K G Jayaraj, General Secretary also addressed the inaugural session. Decisions of the AUAB meeting held on 20-02-2019. Conducting March to PMO on 06.03.2019, by mobilising the employees from the surrounding circles. Memorandum to be submitted to all the MPs, latest by 28.02.2019. To send messages to the Hon’ble Prime Minister and Hon’ble Minister of State for Communications on Twitter.